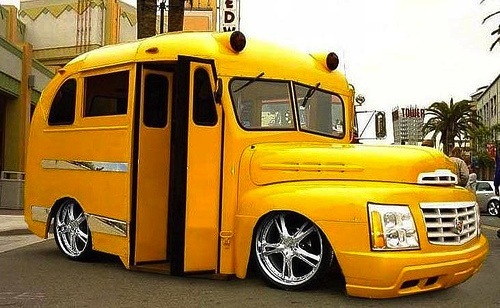 Although school buses have now been standardized for safety, at least in the US, children across the globe arrive for lessons in all kinds of student-ferrying yellow vehicles – from rickshaws to paddle boats – but even here you have to award points for ingenuity. 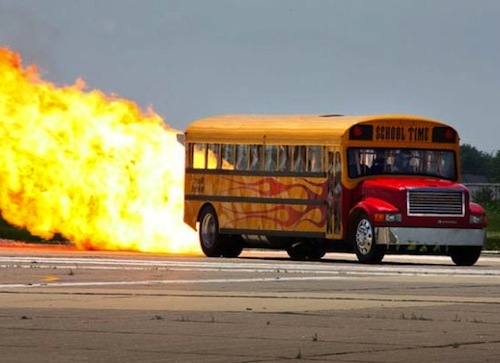 Here’s a look at 10 school buses from around the world that put the “cool” into school. This may very well be the sleekest school bus ride anywhere – and with good reason: it’s part Cadillac. Reportedly, the pimped out, low-riding bus belonged to the Ellesmere Port Specialist School of Performing Arts in Cheshire, England. In 2009, the school merged with Cheshire Oaks High School to form the University of Chester Church of England Academy. 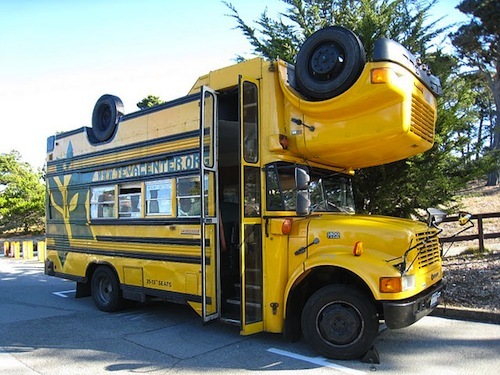 We don’t know whether the bus survived the merger, but students would definitely better enjoy the journey to and from school if it did. Perhaps it was designed to make studying hard a more attractive option. School buses have been yellow in the US since 1939, when national standards were implemented. Officials chose the sunny color because it’s highly visible and makes the black lettering on the side of the bus stand out. Nowadays, the color makes the vehicles instantly recognizable in the US. In Japan, however, there is no standard school bus color. Still, many Japanese school buses have no trouble standing out and making it quite clear that there are kids on board. 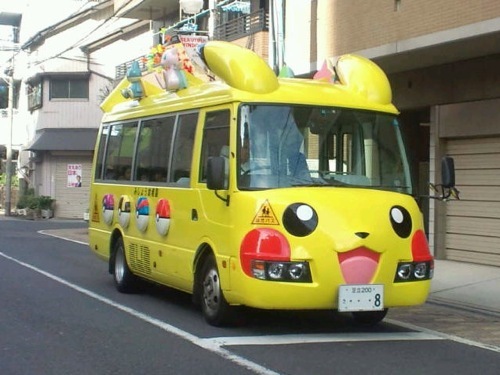 This bus (yellow by coincidence) thrills lovers of Pokémon’s Pikachu at an Osaka kindergarten. Other Japanese schools also have modified buses, with themes including Hello Kitty, Totoro Neko and Thomas the Tank Engine. Things are quite different in India, where students can catch a ride to school in a cramped rickshaw. 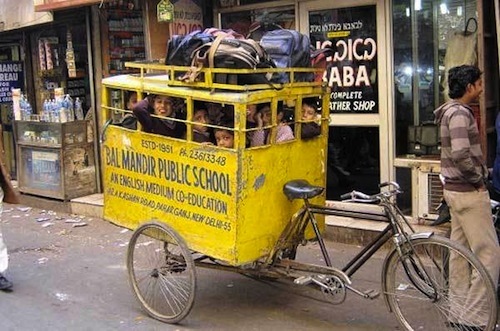 Looking at the photo, there isn’t much room for mischief in this Bal Mandir Public School transportation vehicle; even the kids’ bags have to be loaded on top. And this New Delhi school isn’t the only Indian education establishment that uses rickshaws. That said, though, there are plenty of other ways for students to get to school, from the backs of trucks and horse-drawn carts to tuk-tuks (auto rickshaws) and buses. Safety concerns over the use of tuk-tuks for school children were raised in 2010, and transport minister Radhakrishna Vikhe-Patil took steps to phase them out in favor of buses. However, driver unions protested the change, as it would mean a huge loss of income. Before US school buses were standardized for safety in the 1930s, almost any type of wagon or truck was used to transport children to school. The 44 industry standards set in 1939 made school buses well defined and regulated. Since then, safety standards have become even more rigorous, and changes have been made accordingly. Warning signal lights were introduced around 1946, and in the early 1950s extendable stop signal arms were added. Other additions included emergency exits and reflective markings. And based on the American School Bus Council’s safety stats, all of these standards must be paying off. 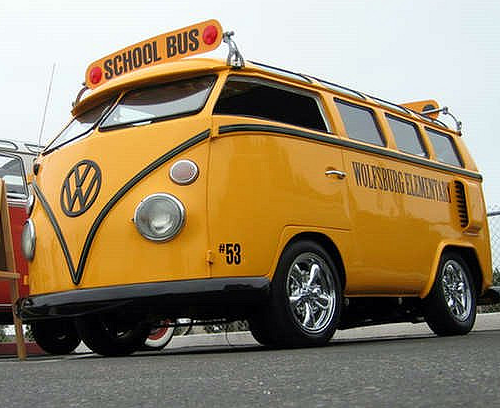 Notwithstanding its signature yellow coloring, this converted VW camper van for one “Wolfsburg Elementary” might not meet US bus safety regulations. Still, as a mod it looks pretty awesome. For kids in Layag-Layag, a mangrove village in the Philippines, getting to school at all was an arduous task. The usual trip included swimming and wading through chest-deep water for over a mile in order to reach the schoolhouse in Zamboanga City. Students had to hold their books over their heads so that they wouldn’t get wet, and they arrived at school in soaking clothes. Thanks to a charity named the Yellow Boat of Hope Foundation, school children in the community were given a boat to get them to school. Now they not only stay safe and dry but arrive in style, too. As of March 2012, the charity had raised funds for three large motorized boats and 120 smaller vessels for three different communities in the Philippines. 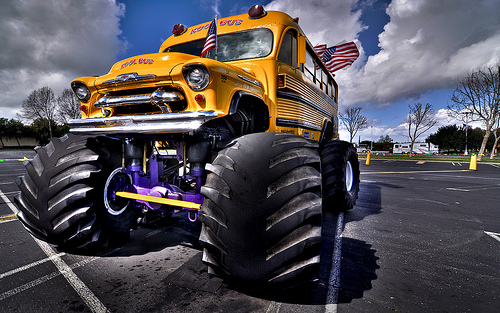 The Monster Kool Bus is the epitome of cool-looking school buses. To begin with, it’s 13 feet high, 22 feet long, has 25-inch-rim tires, and tips the scales at 19,000 pounds – so it’s got size on its side. But best yet, kids can get a ride – albeit not on their way to school. 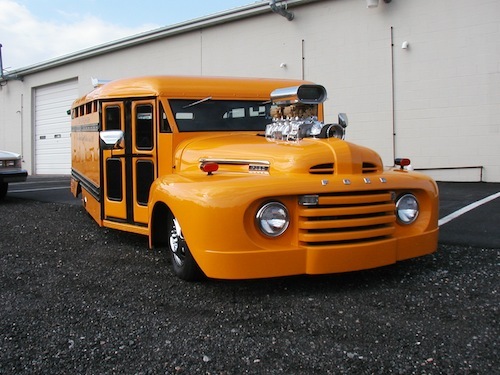 Owner Eddy Haemker, who calls the Kool Bus “the first original monster bus,” modified the imposing vehicle from a vintage 1956 school bus. Haemker rebuilt the bus in 2002, and since then he has used it to support different causes, including a youth center, a school district, and a children’s hospital. Although it isn’t limited to fundraising for school-related fields, the Monster Kool Bus definitely sends kids a positive message – and where else could they ride a school bus that does donuts in the parking lot? Cycling is an integral part of life in the Netherlands. Amsterdam is one of the best biking cities in the world, and almost 50 percent of the country’s workers commute on two pedal-driven wheels. 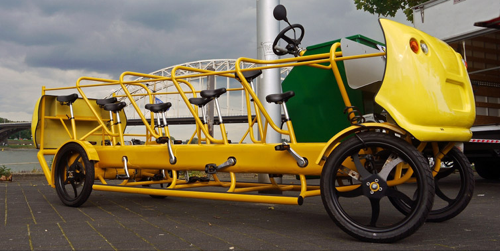 What’s more, the bicycle bus pictured now allows pupils aged four to 12 to get to school in the same way – almost. The bus has room for an adult driver, eight pedaling students, and three more pupils who sit on a bench in the back. The bike travels at about 10 mph, and there’s a motor to compensate for steep inclines and tiredness. The bicycle buses are even available with rain canopies and music. By March 2012, De Cafe Racer, the company behind the design, had made some 25 of the distinctive school buses. They’re an excellent way for kids to get exercise and learn about the importance of green transportation, so even the ride to school becomes educational. 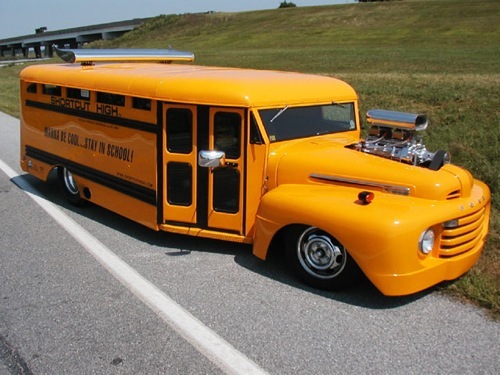 This slick looking set of wheels is the Shortcut High School Bus, and it’s hailed as “the little bus with character!” Although it isn’t affiliated with one single school, this modded marvel travels the US collecting school supplies for disadvantaged students across the globe. Kids, especially, love the vehicle’s radical modification, and their youthful enthusiasm inspired Jerry Bower and his wife Brenda to use it for their benefit. Bowers – the man behind the project – spent five years working on a 1949 Ford F-5 bus, using a Cadillac Eldorado frame and rebuilding the body with aluminum to create the Shortcut High auto. We think you’ll agree it’s a beauty.